Western Neon School of Art is pleased to share our work in collaboration with renowned architecture firm Design Earth as a part of the U.S. Pavilion’s Dimensions of Citizenship exhibition at the 2018 Venice Biennale of Architecture. Design Earth is one of seven commissioned exhibitors chosen by the Dimensions of Citizenship curatorial team that includes Niall Atkinson of the University of Chicago, Ann Lui of the School of the Art Institute of Chicago, and Los Angeles-based critic and curator Mimi Zeiger as well as many other prominent figures in the design and architecture world. Together, they selected Dimensions of Citizenship as the theme of this year’s exhibition; chosen exhibitors were to consider how to engage architecture and unpack what it means to be a citizen within this discipline’s current and, more importantly, future constraints. Dimensions of Citizenship features the work of these seven architecture practices to “explore how citizenship may be defined, constructed, enacted, contested, or expressed in the built environment at seven different spatial scales,” according to the curatorial statement. For Dimensions of Citizenship, Design Earth created “Cosmorama: Mining the Sky, Planetary Ark, and Pacific Cemetery,” three off-world speculative designs which explore the space above Earth regarding space exploration and potential habitation for humanity. As a practice, Design Earth aims to “engage the geographic to open up a range of aesthetic and political concerns for architecture and urbanism.” This goal is evident in their work created for the exhibition; they reach into the cosmos and beyond to start a discussion about the expansion of humanity on and off the planet. Design Earth is led by founder, architect, and University of Michigan assistant professor of architecture El Hadi Jazairy and partner, architect, and Massachusetts Institute of Technology School of Architecture + Planning assistant professor of architecture and urban planning Rania Ghosn. Design Earth’s installation makes up the Cosmos scale, the largest of the seven spatial scales exhibited. It features three backlit triptych drawings in lightboxes depicting futuristic space imagery and series of hanging 3-D printed heads. Placed below the heads is a custom carpet printed with text from the Outer Space Treaty of 1967 and the NASA Space Act of 2015. 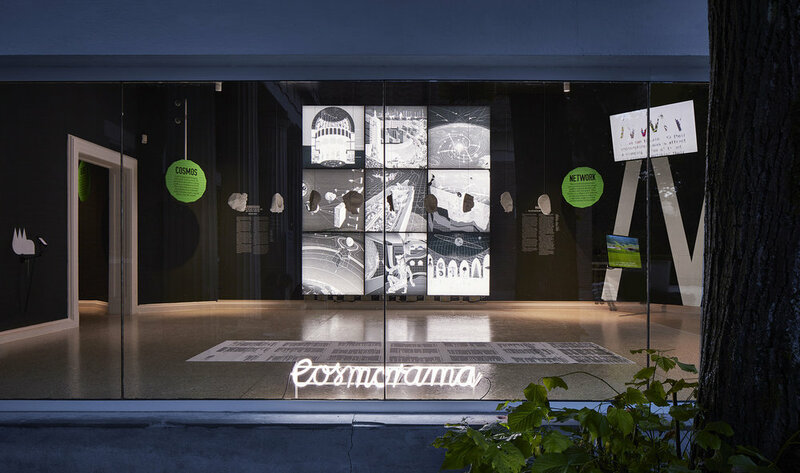 Centered in the window of the Cosmos room rests a four-foot-long white neon sign that reads “Cosmorama” in white script. This piece, designed by Jazairy and Ghosn and fabricated by Western Neon in partnership with Western Neon School of Art, presents the theme in a simple yet impactful manner. The use of soft white neon combined with the fanciful script hints at a nostalgia reminiscent of that found in the twentieth-century fascination with space exploration. This reference back to the origin of why humanity became intrigued with space in the first place, summed up in elegant neon, unites the components of the installation and helps them to function as a whole. 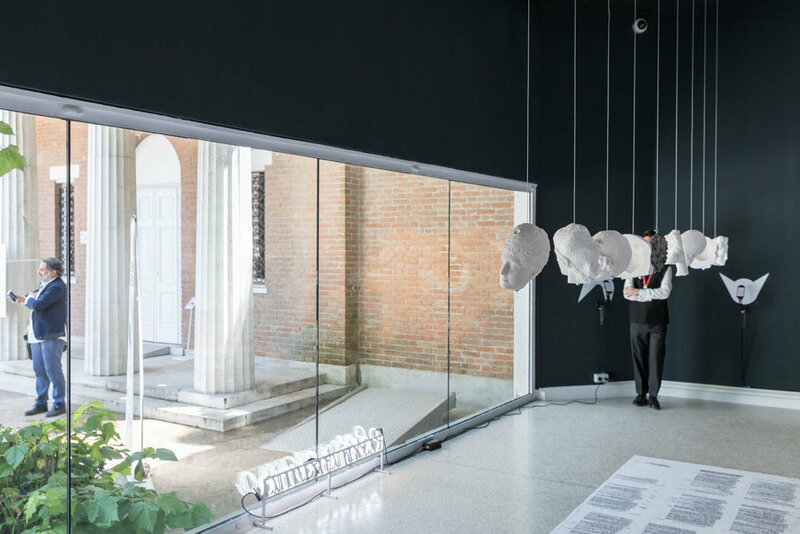 The Venice Biennale of Architecture opened on May 26th and will continue through November 25th, 2018. Learn more about Design Earth on their website and visit the Dimensions of Citizenship page to view contributions by the seven talented teams representing the United States. Follow us on Instagram for information about upcoming classes, events, exciting collaborations, and artist highlights. Questions? Send us an email. Sign up for our newsletter to receive information about upcoming classes, events, exciting collaborations, and artist highlights.